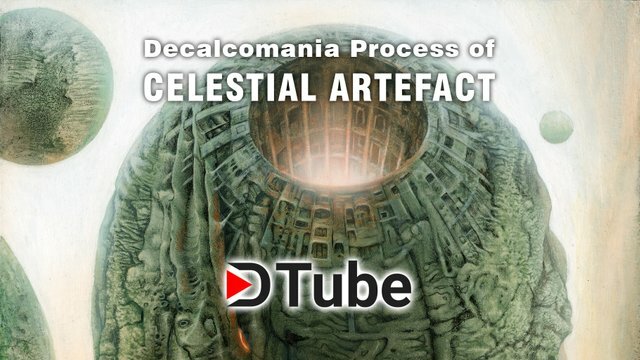 Decalcomania Process of "Celestial Artefact"
A short video about the Decalcomania Process of my painting "Celestial Artefact"
Peter, I love where you took this, remembering some earlier posts about decalcomania! I've been doing this also off and on since the late seventies, and am currently working on a piece for Magical Dreams (incorporating some decalcomania). This process does not lend itself all that well to large canvases, so the dimension you are working with here is probably just right. Mind you, Max Ernst's "Europe after the Rain" is monumental. Whenever I tried something that large, I failed and wound up cutting it up into "useful" pieces. Yes, I have the same problem with larger formats. An alternative would be to do a small Decalcomania and print it on a large canvas to paint over it. yes, but that would not be the same - I like to go "unplugged". I think he did it in oil. Might behave different, I never tried. Awesome artwork. Thanks for the process video.